To be healthy is to be happy on all levels—physically, emotionally, mentally, and spiritually. And to be happy is to be healthy on all levels—physically, emotionally, mentally, and spiritually. It sounds like an easy remedy—and the good news is it can be. You can start right where you are, just the way you are. It all starts with self-love. It’s easy to love yourself when everything is going according to plan. However, can you love yourself when you’ve just lost your job? Is it more challenging to love yourself when your partner chooses to end your 10-year relationship? Do you love yourself less when you’ve been diagnosed with a serious aliment? How about when someone close to you dies? Difficult times, such as these, are when you need to rely on your reserves of self-love. The reserves of self-love to which I am referring are the all times when you succeeded in achieving a monumental goal. Like the time you landed your dream job; ran a 5K at your personal best; or completed your college degree. Your self-love reserves also include all the things you did that delighted your soul, like when it was time to purchase your first home, and you did, or when you decided to marry the love of your life, and you did. The way you felt when you accomplished these intentions, is the energy of self-love. It’s all within you. It’s been stored up over time so that you can access it now when you need it the most—for your health and happiness. When a life-changing challenge arises and I’m faced with a stressful decision, I access my reserve of self-love by asking the simple question, “What Would Love Do Right Now?” This question grounds me in reality, helps me stay focused, and provides a positive frame of mind in which to create a more loving outcome. I have shared this question with many of my clients, colleagues, and friends. They have all shared amazing stories of the difference this inquiry has made in their lives. I invite you to apply this to every area of your life and enhance your health and happiness as well. How can you apply this profound question to your physical well-being? Self-love might look like following an organic food plan that supports your vitality, establishing an exercise routine as simple as walking in nature every morning, brushing and flossing your teeth three times a day, and scheduling preventative wellness examinations with qualified healthcare professionals.” As with all suggestions, unless you take dedicated action, they just remain good ideas. Applying this question, “What would love do right now?” is crucial to your emotional health and happiness. Self-love might look like standing in front of a mirror and saying, “I love you and accept you just the way you are, and I want to live a long healthy life. Perhaps, love would seek to make amends with those who you have harmed. It may be time to open your heart to love again, free to share your intimate feelings. For those who suffer from deep regret, overwhelming bitterness, and the pain of betrayal, I offer repatterning sessions to clear the past and allow you to love again. Applying self-love to your mental well-being, might look like taking the time to focus on what you really want in life and writing down your goals. Remember to include a completion date, otherwise it’s just a wish. Love would have the courage to reach out for the support you need to accomplish your goals. Perhaps, love would quiet the chatter in your head by creating a to-do list and a plan to complete the tasks. Love would also maintain an optimistic attitude. Asking the question, “What would love do right now?” is essential to connecting you with your inner divinity and expressing your spirituality lovingly. Getting in touch with your spirituality might look like meditating for twenty minutes each morning and evening. Love might look like journaling every evening at bedtime about those wondrous moments for which you are grateful, and forgiving those who may have offended you. The more peaceful you are before sleep, the more restful and rejuvenating your sleep will be. You are responsible for the quality of your life. Every moment you are being given an opportunity to be happy and healthy—to grow and transform. It may be necessary to first get rid of what’s holding you back from fully engaging in life. I can help you to engage fully in life, so that life can fully engage with you. The rewards are extraordinary. Take time to nurture yourself. Be good to yourself. Love yourself. In fact, love yourself to wholeness. 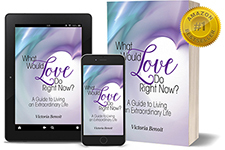 Asking myself the question, “What Would Love Do Right Now?” prompted me to write my Amazon #1 best-selling book by the same title, which is now available in print as well as an eBook online. It is the quintessential guide to living an extraordinary life.